The Pentagon tapped Army Gen. John Campbell to be the top U.S. commander in Afghanistan, making the four-star general responsible for overseeing the final American withdrawal from the country. Defense Secretary Chuck Hagel announced Campbell’s nomination to replace outgoing commander, Marine Corps Gen. Joseph Dunford as the head of International Security Assistance Force (ISAF) in Afghanistan on Wednesday. 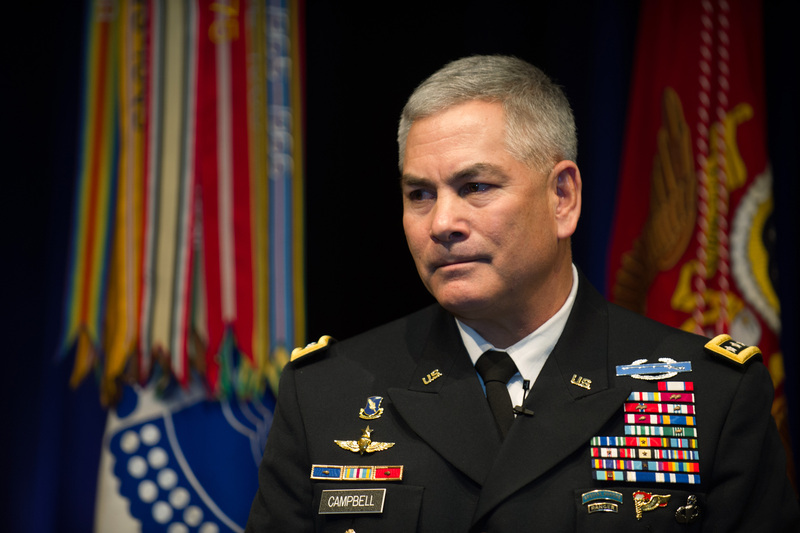 A career infantry officer, Campbell is currently the Army’s Vice Chief of Staff and has held senior command assignments in Iraq and Afghanistan, as well as stint leading an Army Special Forces Operational Detachment-Alpha (ODA) with 5th Special Forces Group, according to an Army bio. If confirmed by Congress, Campbell will be tasked with implementing President Obama’s withdrawal strategy from Afghanistan, ending the over decade-long war there. The plan, announced earlier this year by the White House, envisions keeping 9,800 U.S. troops in country until the end of 2015. After that, Pentagon and administration officials plan to drawdown that force thru 2016, when the U.S. presence in Afghanistan will be limited to security forces for the American embassy in Kabul. However, Washington and Kabul will need to finalize a postwar plan, known as a bilateral security agreement, before the White House plan can be put into place. Aside from Campbell, Hagel also announced the nomination of Adm. Bill Gortney to replace Army Gen. Charles Jacoby as the head of Northern Command. The four-star general was the first ever Army general officer to take the reins at NORTHCOM. Gortney is currently the commander of U.S. Fleet Forces Command. The Pentagon chief also named Army Lt. Gen. Joseph Votel to replace Adm. William McRaven as the new head of U.S. Special Operations Command. Before Wednesday’s nomination, Votel was the top officer in charge of U.S. Joint Special Operations Command, a position McRaven held before he took the reins at SOCOM. During his time at JSOC, Votel oversaw some the U.S. military’s most sensitive clandestine military operations. Most recently, JSOC members participated in the capture of Ahmed Abu Khatallah, one of the alleged conspirators who planned the September 2012 attack on the U.S. consulate in Benghazi, Libya that ended with the deaths of four Americans, including Ambassador Chris Stevens. “All three are highly qualified officers who have devoted many years of service to their country,” Hagel said in a statement Wednesday. “They will be outstanding successors to Dunford, McRaven and Jacoby, “who have all been exemplary and highly effective commanders” the DOD chief added.